software developer and trainer: my focus and passion in development lies on applications in Java (desktop with JavaFX and Java EE with JSF, CDI, EJB, JPA), databases (mainly Oracle with PL/SQL) and other languages on the JVM like Scala or Groovy. Lifting of Nichols Algebras, Südwestdt. Verl. f. Hochschulschrift., ISBN 978-3-8381-1084-4, Diss. (2009), see below. Nichols algebras are a fundamental building block of pointed Hopf algebras. 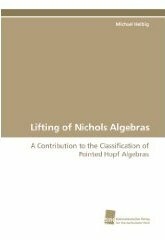 Part of the classification program of finite-dimensional pointed Hopf algebras with the lifting method of Andruskiewitsch and Schneider is the determination of the liftings, i.e., all possible deformations of a given Nichols algebra. The classification was carried out in this way in several special cases when the appearing Nichols algebras are of Cartan type. We compute explicitly the liftings of some Nichols algebras not of Cartan type or of Cartan type without restrictions on the group order. These build up new classes of finite-dimensional pointed Hopf algebras. Furthermore, we give a necessary and sufficient PBW basis criterion for a class of pointed Hopf algebras and present them in terms of generators and relations. These Hopf algebras can be seen as generalized Quantum groups. published online as pdf at UB München, as paperback available at e.g. at amazon (see on the right). Copyright 2013 by Michael Helbig - Imprint. Awesome Inc. theme. Powered by Blogger.